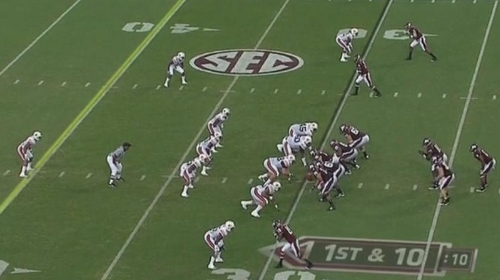 Here, Chris Relf is in a pistol formation on a triple option run play. Michigan saw this a lot against Illinois and had a lot of trouble with it. Illinois is in the same formation as Mississippi State above. Michigan is showing a traditional 4-3 formation, but Jordan Kovacs is walking down toward the line of scrimmage to turn Michigan into a 4-4 look. 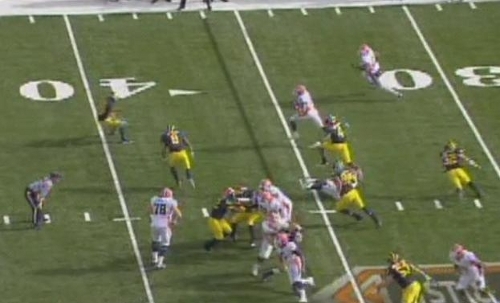 During the Illinois game, Michigan was pretty blitz happy. Cam Gordon spent a lot of time blitzing off the edge, and Michigan generally brought more pressure than they have against any other opponent. Obviously, it didn't end so well. It's a high variance defense that probably causes more problems than solutions against option teams like Illinois and Mississippi State. 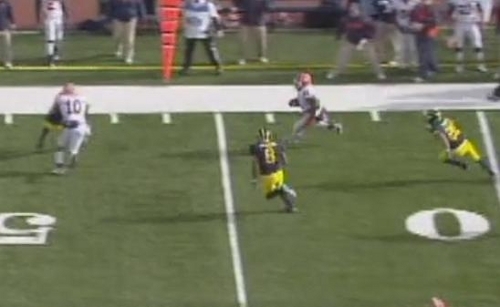 This play in particular went for a lot of yards. After the snap, you can see that Michigan is bringing their four down linemen as well as Gordon and Kovacs off the edge. I understand the theory behind this: jam the middle with four linemen to take away the dive play and blitz the edge to keep contain on Scheelhaase and the pitch. 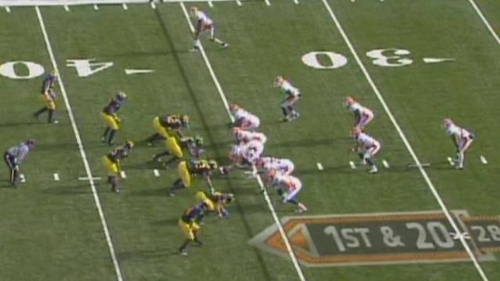 Unfortunately, Michigan's defense is Michigan's defense and that rarely happens. Here's where the problem starts. Kovacs (red), who was sent on an outside blitz, has started to crash down on the play rather than work outside. Illinois' slot receiver is approaching Kovacs and will seal him to the inside, leaving Jonas Mouton and Kenny Demens to come from the middle linebacker positions, across the field to stop the play from getting outside the tackles. Kovacs effectively gets inside the slot receiver and into the backfield. 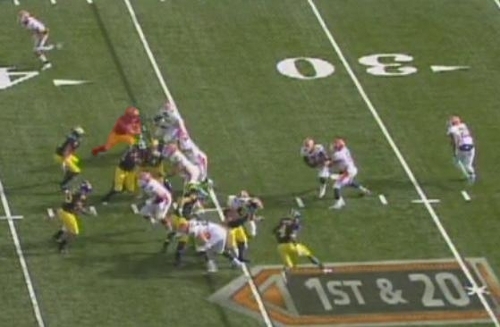 Unfortunately, Scheelhaase has pulled the ball and is headed to the outside with an option back next to him. Ray Vinopal is coming down from his safety position to help out in the run. Mouton, who is at the hash and unblocked needs to turn and get outside of the tackle and wait for Vinopal to force the play back to the inside. 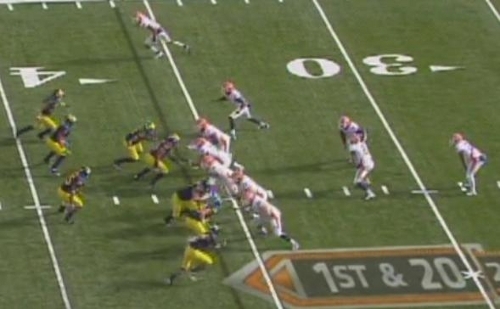 Michigan is in pretty good position to shut this play down here. Vinopal is squared up and in position to force the play back inside but gets anxious and attacks Scheelhaase, forcing him to pitch the ball. Mouton dives and misses, and this play goes for a touchdown on 1st and 20. Against Illinois, Michigan spent a lot of time with four linebackers, whether it was in the 4-4 like this or the 3-4 we've seen occasionally through the year. I expect similar formations against Mississippi State, but whether or not they blitz as much as they did against Illinois is something we'll have to keep an eye on. Regarding this play, you can probably expect a similar performance from Kovacs in the future. He's an established starter with a lot of playing time under his belt. This sort of mental mistake in the run game is something he's going to need to limit if Michigan is going to have any chance against the Bulldogs. For Vinopal, however, we may be able to expect smarter play in the future. This was either the first or second game that he played significant time, and his mistake was clearly the fault of inexperience. Whether or not he's actually learned from this game is yet to be seen, but I've been encouraged by his play this year and expect him to be better in the bowl game. Michigan is going to see this formation and similar plays a lot (including a triple option play with an inside pitch option that the Bulldogs showed against Auburn that I'll discuss sometime, probably). 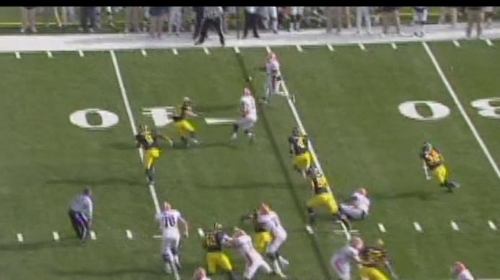 In general, defending option offenses like this take a lot of discipline and knowing where your help defense is. If Michigan allows Mississippi State to break contain like they did against Illinois, it's difficult seeing them winning this game. Agree, I think this was Vinopal's second game at FS and Mouton seemed to play injured most of the game, which combined for a TD on a 1st and 20 (would have been a first down anyway, which is the bigger issue). Regardless, contain should be a little better. What's your take on Vick Ballard vs. LeShoure? I'm not sure re: Ballard vs. LeShoure. LeShoure has looked really good this year, so even being on his level is pretty high praise. I'll be able to comment more after watching more Miss St. games, but I'd venture to say LeShoure has the edge.